Manager John Hughes is not writing off the challenge for third place posed by Dundee United and St Johnstone despite his Inverness team moving seven points clear in the Scottish Premiership. 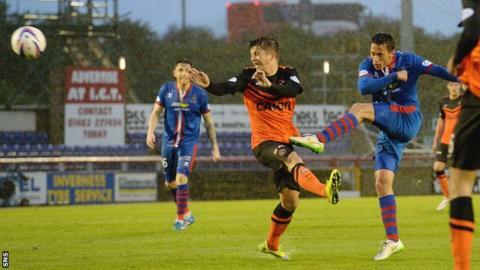 Goals by Edward Ofere and Danny Williams helped Inverness to a 2-1 win against United on Tuesday evening. Hughes warned: "St Johnstone and United have been at us and it's not done yet. "It will go right to the wire. We'll enjoy it, we'll get back to work on Thursday and see where it takes us." With Celtic league champions and Aberdeen clinching second spot, the fight for third place and a Europa League qualifying slot remains up for grabs. Scottish Cup finalists Inverness are in a strong position for that place, which would be their highest ever finish in the top tier and guarantee them their first European foray. They have still to play Dundee, Dundee United and Celtic before the league ends but they know if they win at Dens Park on Saturday they cannot be caught. Hughes praised the desire of his players to win against United on a miserably wet night. However, he was horrified at the loss of a goal after two minutes when Gary Warren's pass-back got held up on the soaking surface and goalkeeper Ryan Esson's hurried clearance landed at the feet of Robbie Muirhead who lobbed into the empty net from 40 yards. "To lose a goal like that was really disappointing but all credit to them for coming back to win the game," he said. "I am absolutely delighted for them. "Of late, we've been losing a late goal. We've got a wee habit of sitting in. The best thing is to keep the ball moving and let the other team do the running. "Dundee United hemmed us in for the last 15 minutes and I'm glad we stood up to it. I felt we got deeper and deeper but we thankfully got away with it." Dundee United manager Jackie McNamara refused to blame the wet conditions, and felt his side should have done more with the chances they created. "We got a good break with our goal," he said. "I'm disappointed with the way we lost the goals. "In the second half I think we should have scored at least one. It's a game we should have got something out of. We had chances. "Some of our decision-making was disappointing. Mistakes led to our first goal and their first goal but there were a lot of things we could have done better with those conditions." The result leaves United in danger of missing out on European football, with the likelihood now that Inverness will claim third place. That means United must finish ahead of St Johnstone in fourth place, and hope John Hughes' side win the Scottish Cup against Falkirk on 30 May. McNamara added: "I'm disappointed. We're guilty of being naive, some of our free-kicks. We're playing little balls there and we've pushed three up front. "It was working, but we stopped doing that. We started hitting the ball longer."